As a top-brand tissue paper making machines and production lines supplier, Lahooti Printech can provide you with types of tissue Machine for sale at a competitive price. 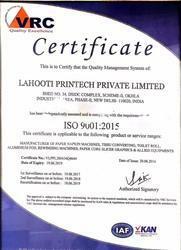 For over 5 years’ Manufacturing & exporting experience, Lahooti Printech has supply Their Many machines to Many Big Brand in Tissue paper business all over the world. We always supply our customers the whole tissue manufacturing production line from the low-grade to high -grade, to meet different customers’ demands. Our Main Products are Paper Napkin Machine, Toilet roll Making Machine, Aluminium Foil Rewinding Machine, Paper Napkin Packing Machine, Paper Core Slicer & Allied Equipments. 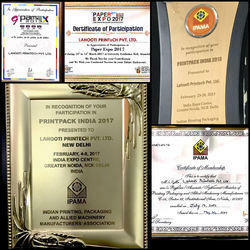 Upholding the principle of”Customer-orientation”, Lahooti Printech Pvt. Ltd. continues making great efforts to meet the all most demands and requirements of our clients, supplying them the most advanced equipment and good after-sales service. All our activities are strengthened by our modernized work set up that is sprawling across a large area. Our infrastructure boosts our pursuit of excellence, as we have invested the substantial amount in optimizing our product development proficiency. Our factory base is backed with high-speed machinery and computerized design technology, whereas our distribution department is fully equipped with hyper-connectivity to streamline our global supply chain. In this competitive ecosystem, quality compliance plays the significant role. Our defined quality policy makes us accountable to meet the ongoing regulatory demands regarding highest manufacturing standards. We are staffed by assiduous quality assurance associates who make sure to omit the compliance vulnerabilities in the procured inventory of raw material and further conduct rigorous quality tests to review the best practices of product development. For the purpose of manufacturing the offered range, best quality materials are used. After designing and final finishing, the offered range of automatic paper converting machine undergo various quality assurance procedures. For this, we have established an in-house quality testing unit. This unit is well-equipped and known for carrying out standardized quality testing procedures. 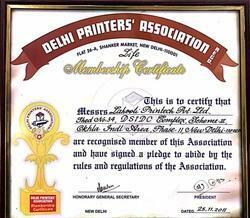 Being a quality conscious and renowned name in this domain, we assure that the best quality of the offered range of Paper Converting machine is maintained.